The desktop VLS3.50 is small enough to fitt on a work surface yet powerful enough to meet the requirements of on-demand production. 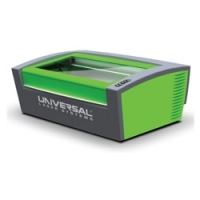 Used frequently for educational purposes, the VLS3.50 is also a great choice for starting your laser business. Offering a material processing envelope of 24" x 12" x 4", 1,152 in3 (610 x 305 x 102mm, 18,878 cm3), the VLS3.50 can be equipped with one of five ULS laser cartridges ranging in power from 10-50 watts. The VLS3.50 comes standard with Laser Interface+ and a number of additional options are available to enhance your laser processing capabilities. All Universal laser platforms use interchangeable components, giving you the ability to tailor your system to fit your needs.